Announcement All stockings and purses listed are ready to ship. We are not taking custom orders this year unless existing customers with new family members. The cut off date for those custom orders is November 10th. The last day to purchase for Christmas delivery in the US is December 18th. Spongetta is all about happy accidents. Our patterns are classic, but our fabrics are those left behind such as remnants, end bolts, yard sale finds, and discontinued upholstery samples. As we work in limited quantities, some fabrics may sell out quickly. This is where misfit fabric has found a home. If you have picked out a set of stockings, send us a convo and we will snap a picture so you may see how they look together. We understand that selecting a set for a family takes time and many conversations among members. Please contact us with the URL of each item you are interested in so we may manually reserve it for up to 48 hours. Placing an item in the shopping cart does not reserve it. All stockings and purses are ready to ship and may not be altered. Feel free to ask if we have more of fabric to make something that fits your aesthetic. We have put together a Pinterest board of some great DIY ideas to add names and initials to your stockings. https://www.pinterest.com/spongettab/personalizing-stocking-ideas/ We do not have an embroidery machine and are unable to add names to the cuffs. Custom orders are considered only if we have the fabric in our collection and time in the production schedule. We work from scraps and remnants and may not be able to recreate a design. Looking for our vintage items? The purses, textiles, and maps are now available at http://www.etsy.com/shop/ElsieSaidSo . All stockings and purses listed are ready to ship. We are not taking custom orders this year unless existing customers with new family members. The cut off date for those custom orders is November 10th. The last day to purchase for Christmas delivery in the US is December 18th. Love these so much!! This is the 3rd stocking I ordered from her. She made them special for me so I can modify them like I did my BF last year. These are for my kiddos!!! Thank you!!! Every Spongetta purse is lined in a complimentary fabric. Many of them come with a patch pocket. This one is a beautiful cotton batik with an upholstery remnant gold pocket. A little bit geometric and a little bit celestial, this is one of my favorite bags. There are countless options for personalizing stocking with stick on, sew on or iron on letters from many retailers. We offer gift wrapping for a small fee using leftover fabric tied in the Japanese furoshiki style of folding fabric. A fun addition to the offerings this year. We turned discarded t-shirts into shopping bags. In the land of misfit fabric, you will find a selection of handmade objects from original designs. I love mid-century modern and everything with a 70’s vibe. The designs are not earthshakingly new, but rather twists on the traditional reinterpreted with unexpected materials and shapes. Inspiration comes from all over my house and yard. Many of the purse patterns are based on the dishes in the cupboard. Although most supplies are new (will be mentioned in the descriptions when they are not), they are often the disassociated; discontinued upholstery samples, scraps from alternations, end bolts, remnants, and yard sale finds. The stockings started it all when, as the youngest, I graduated from high school and we realized none of us had adult stockings. I developed the pattern, which has been tweaked over the years, for these heirlooms we have been using for over 20 years. These have become my go-to gift for weddings and newborns and has become a great joy in building traditions with families as they grow. The purses were also born of necessity when I found myself without a job and lots of time to sew. The hipster pouches were first and remain one of my favorite designs. These have always been popular locally. At one point, I found myself with a pair of ring handles. The turkey platter lent some inspiration and the Spongetta Handbag took shape. It is still so much fun to experiment with fabrics and shapes to create the perfect bag. After many requests, we added the shoulder bag to the line. Spongetta is about looking at the world just a little bit differently. My goal is to meld the elegant with whimsy. Sometimes we use traditional techniques with a nontraditional fabric. Other times, it is the color that is a surprise. My favorite thing to do is create a patchwork from rich fabrics such as velvets and silks, but then relaxing them a bit with cottons, burlaps and denims. Classic patterns such as paisley, fleur de lis, Jacobean, and houndstooth embrace a kitschy feel that is both retro and modern. My dream is to make taffeta popular again. This is the place where misfit fabric finds a home. The name Spongetta was granted to Betsy in college during a game of Trivial Pursuit when she was dubbed a "sponge of useless knowledge." It is all about the fabric! I love unusual textures and combing them in interesting ways. My current favorite obsession is double knit polyesters for the amazing body and texture of the fabric. Welcome to the land of misfit fabric. Our goal is to reinterpret classic designs with nontraditional materials. Although most supplies are new (will be mentioned in the descriptions when not), they are often the disassociated including discontinued upholstery samples, scraps from alterations, end bolts, remnants, and yard sale finds. This scrounging for materials results in one of kind, or very limited editions, of items. If you are not happy with your purchase in any way, please contact us to resolve the issue. We will always offer a refund of the item cost if you are disappointed with the quality of work or if the description does not match what you received. Please notify us immediately and return item within 7 days. We accept credit cards through Etsy Direct Checkout and PayPal. Items will be shipped once payment has cleared. Alternate payment methods will be considered when contacted directly. Please contact me if you have found the perfect thing but need some more time and I will manually place it on reserve. Items will be reserved for a maximum of 48 hours unless we agree otherwise. We ship through USPS for both domestic and international, unless otherwise stated in the listing. Packages are processed several times a week depending on need. We use the Etsy shipping tool that calculates your shipping based on weight, volume and location. Sometimes it is overly enthusiastic and comes up with a number that is grossly inflated. We will always adjust as necessary to reflect the actual shipping plus a small handling fee. A refund for the additional amount will be issued through the payment system chosen. Particularly for addresses outside the United States, please feel free to contact us for an adjusted shipping amount. The buyer is responsible for all customs fees associated with items crossing borders. Customs forms will always match the included receipt. Upgrades for international shipping and insurance are also available. No custom orders or personalization available this year. As we work from remnants and scraps to keep the material costs low, we only take custom orders when able to make from existing fabric stock and have the time to complete the project. We do not take pieces apart to makes significant changes like cuffs, linings or straps as many of the fabrics I use do not take kindly to the stress. If you talk me into it, modifications may require an additional reconstruction fee. All fabrics are in limited quantities, so please note that they may sell out quickly. Placing an item in the shopping cart does not reserve it. Please contact us with the url of each item you are interested in so we may manually reserve it for up to 48 hours, unless we agree otherwise. All stockings and purses are ready to ship and may not be altered. We work from scraps and remnants and may not be able to recreate a design. The stockings come in one size as we do not alter our pattern. As we work from small quantities of fabrics, we may not be able to recreate a design. Custom orders are are considered if we time and fabric. Always feel free to ask to see what we have in stock. We do not have the capabilities to embroider stockings, but offer you a selection of DYI options available cheaply from chain craft stores, auto parts stores, big box stores, etc. The sizes for each item are available under the "Item Description" tab. If you have further questions or would like to see the item within context of surrounding, just ask, we will send you a picture. 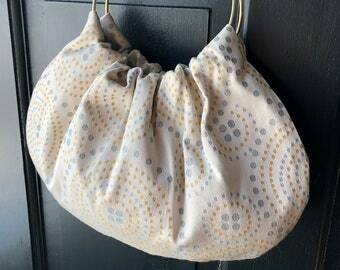 We are very happy to wrap your stocking or purse in fabric in the Japanese furoshiki-style. You may choose this option in the checkout process. Please note the fee stated is for all of the items in an order wrapped together. If you wish them wrapped individually, please send me a message prior to check out.